Lappeenranta Rajaritarit (Border Knights) of the Finnish Maple League have signed running back Nate Kmic to replace injured back Mike Bolio to help the team’s quest to reach the Finnish championship game, Maple Bowl XXXII. 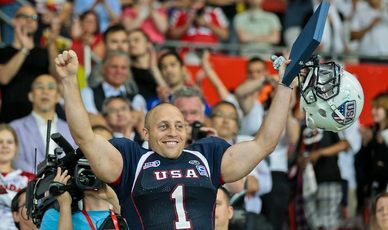 Kmic was the star of the 2011 IFAF Senior World Championship, winning tournament MVP honors as the United States defeated Canada to win the Gold Medal in Vienna on July 16. Kmic rushed for 94 yards and 4 touchdowns on 22 carries in four games and also posed a significant threat as a pass-catching back and when lining up as a receiver. He made 28 catches for 278 yards and a touchdown, leading the US in receptions in all games. “We want to play for a national championship and I am sure, that Nate Kmic will help us with our ground game,” said Rajaritarit head coach Mikko Hovi. Rajaritarit lost their starting running back Mike Bolio, a product of Los Angeles Harbor College, in last Sunday’s away game against Helsinki Wolverines. Due to transfer regulations, the team was not able to sign any current players from Europe, but Kmic came to mind as one option to pursue following his success in Austria. Kmic, who is the NCAA all-time rushing yardage record holder with 8,074 yards gained in his career with Mount Union, showed in Austria he can be an impact player at the highest level and Rajaritarit will look to him to ensure production in their running game. American football has been played in Finland since 1979. The American Football Association of Finland (SAJL) has currently 32 member clubs across the country with 2,000 men, women and youth players. The men’s national championship is played at four levels and the winner of Maple League, the highest level, will be crowned the national champion. Maple Bowl XXXII will be played on Saturday, August 20 at the Sonera Stadium in Helsinki and the game is available on television through Urho-TV as the national broadcaster and Eurosport2 as the international broadcaster. “It is great to see that Finnish American football is seen as one attractive option to continue a playing career after college football,” said Roope Noronen, President of the American Football Association of Finland. Kmic still plans to return to his coaching position at the University of Mount Union, where he coaches the Purple Raiders’ running backs. Mount Union coach Larry Kehres understands that Kmic will be returning late. Kehres was Team USA’s offensive coordinator in Austria under head coach Mel Tjeerdsma. “He’s very supportive of my choice,” Kmic said of Kehres. Before the IFAF Senior World Championship, Kmic had not played a snap in almost three years. Teams from Germany, Austria and Italy have contacted Kmic about playing next season; all are offers he will consider. For now, he plans to return to Ohio after his stint in Finland and join another European team before the spring. This entry was posted on July 22, 2011 by Jamaal Jonas. It was filed under Sports and was tagged with Maple League, nate kmic.